Petula was of course named after her predilection for animals, and her role in Cheeky's world was to provide the opportunity for wildlife witticisms, bestial badinage and creature capers. On her first appearance, in Cheeky Weekly number 14 dated 21 January 1978, the young zoological zealot was the custodian of a hamster. It wasn't long before Petula's choice of animal companion veered into the exotic, and in the 11 February 1978 issue, The Mystery Comic was to be found in the beak of her pelican pal. The following week Petula was accompanied by a strangely familiar-looking ape. In the 08 April 1978 edition Petula appeared 6 times with that week's pet of choice, a mynah (or minah as the comic has it) bird. Petula warned the toothy funster that the bird had been taught 'naughty words' but parents of impressionable Cheeky Weekly readers needn't have worried as the strongest epithet to emerge from the voluble avian was 'smelly feet!'. For more on the mini-comics see here. 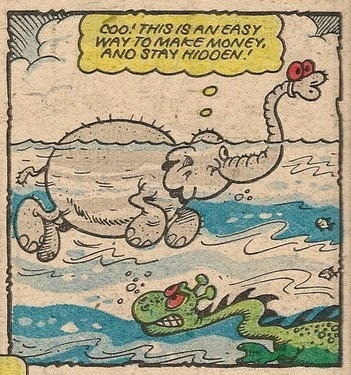 ...maybe the above storyline inspired Elephant On The Run. Petula was again examining apparent elephant spoor on Tuesday in the 05 August 1978 issue, but I suspect that Teacher may have laid a false trail as this was the issue in which the podgy pedagogue exhibited aberrant behaviour following a nervous breakdown. 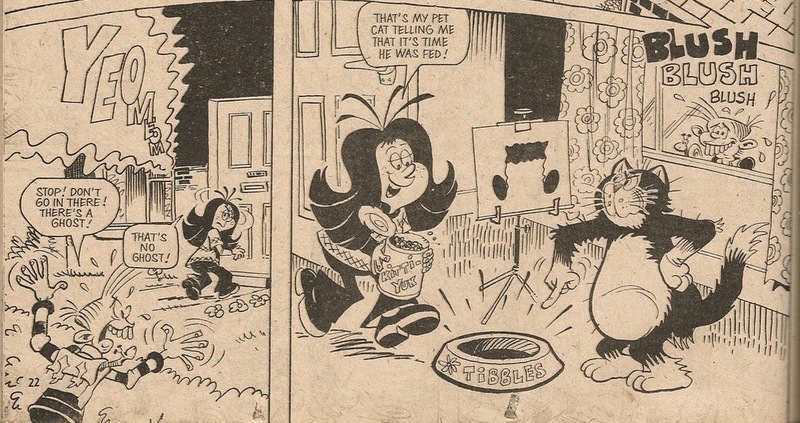 Cheeky's pal with a passion for pets appeared on 5 covers (06 May 1978, 28 April 1979, 21 July 1979, 05 January 1980 and 19 January 1980 - which was also the final edition to feature her, so she didn't quite make it to the comic's farewell issue two weeks later). Petula was seen with a tiger in tow, strolling casually towards the cat show, on the Pin-Up Pal poster in Cheeky Weekly dated 26 August 1978. Frank McDiarmid's depiction of the big cat is rather splendid, and the poster can be seen on Bruce's blog here. 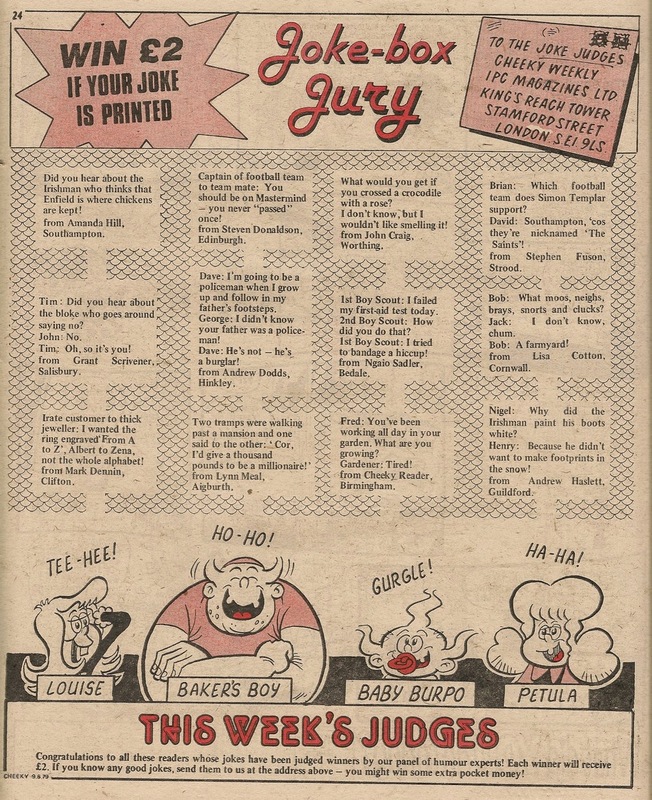 Cheeky's Cut-Out Catalogue of Petula Jokes was contained in the previously-mentioned final issue to include the pet-potty pre-teen, Cheeky Weekly dated 19 January 1980. 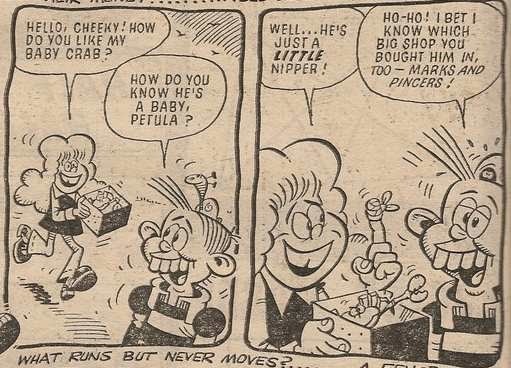 Petula featured in 82 editions of the toothy funster's comic, but made a single appearance in Krazy - the 15 April 1978 edition. 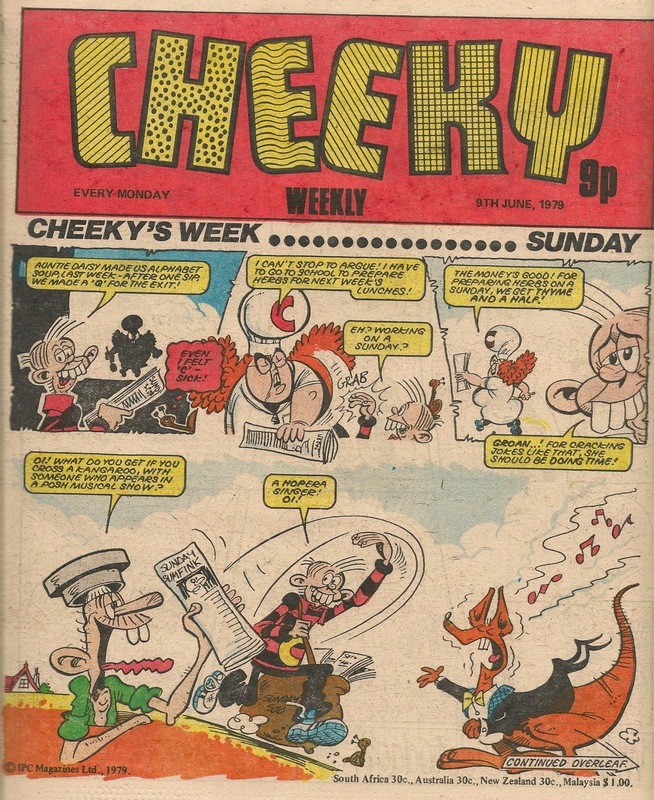 Bruce has been examining the varying approaches to the announcement of comic merges adopted by IPC and DC Thomson, including the demise of Cheeky Weekly. Following the examples of George and Bruce, I thought I'd give a brief tour of my Cheeky collection and allow a little peek into the work behind this blog (it's not just thrown together, you know). My Cheeky Specials are in a somewhat inaccessible (but also dark) location at the moment, so you'll have to imagine them in a pile. Here are my Krazys during a brief exhumation from their usual gloomy resting place. Some years ago I became concerned that my comics may deteriorate, so I decided to begin the long process of scanning them as a kind of backup to the physical copies. I started with my Buster collection (amounting to about a year's run from the mid/late 70s), and was surprised to find that it takes an hour to scan a 32-page comic (I'd assumed it would take about 10 or 15 minutes! ), and that's without adjusting the quality of the raw scans. As readers of this blog will know, I decided not to spend any time in modifying the scans, since the task I was undertaking was time-consuming enough without any extra fiddling. Having gained experience in scanning the Busters, I moved on to digitise my Cheeky Weeklys. I included the comic title, issue date, page number, element name(s) and artist initials in each filename, and as I looked at the slowly increasing list of files I realised that I could do some analysis on the contents of the folder in which I saved the scans. 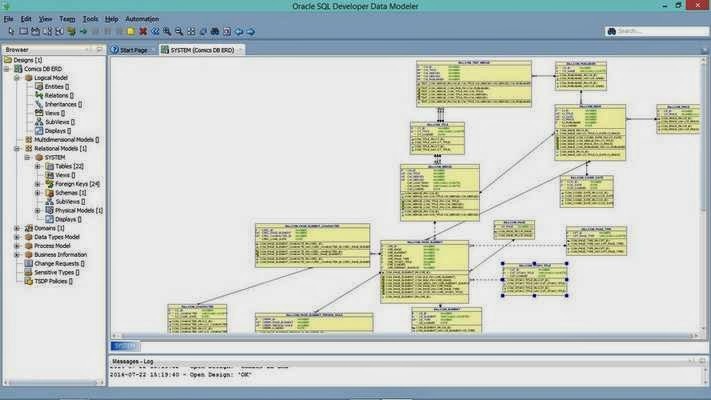 For example using Windows' search facility it would be possible, once all the scans were complete, to isolate all the instances of a particular strip. However, having a background in databases I knew that a comics database would offer far more varied and powerful ways to slice and dice the data. Around this time I also began thinking about writing a comic blog, having been inspired by Lew Stringer's superb work in this field. As I'm nowhere near as knowledgeable about comics as Lew, I thought by sticking to what I know (i.e. Cheeky Weekly), and using the scans I was creating, I might be able to put together a half-decent effort. I therefore designed and built a comics database, then wrote some code that would read through the filenames in my comic folder and extract and load all the information from the names into the appropriate tables in my then-empty database. After some late-night coding sessions writing the procedures to manipulate the various types of data I nervously kicked the process off and was pleasantly surprised to see that it worked first time. I then decided to introduce a further level of granularity and recorded in my database all the occurrences of the Cheeky's Week characters by element per issue. This data is used in my Profile series. I also did the same with the characters in the Cheeky strips from Krazy, although that information exists only as a spreadsheet at the moment since I haven't loaded any Krazys into my database yet. Further time was spent in writing code to do the various types of analysis I use on the blog ( I wrote code to generate the output in the form of HTML tables as well). I'm particularly pleased with the Cheeky Weekly Index, the procedures that isolated the relevant elements and constructed the Mystery Comic tables, and the Cheeky's Week - Artists by issue and % table. As well as being backups to the physical comics, the scanned comics make doing the research on the blog posts so much easier than continually referring to the actual issues. For example, viewing the files as extra large icons is ideal for scrolling through in search of a particular image. Continually flicking through the real comics would result in them becoming worn. I don't share my scans (other than the selections posted on this blog) - they are purely for my own research. Since last November I have been scanning my Whoopees with the intention of creating digital copies of all the issues from the Cheeky merge to the end of the comic's run. I'll then load the data into my database to facilitate some planned blog posts on the post-Cheeky lives of the strips from the toothy funster's comic which survived the merge. I had intended to scan an issue a day, but the inevitable intrusion of other commitments has meant my scan rate has dropped a bit recently. I'm hoping I can finish all the scans by the end of this year or soon after. The latest issue to be scanned is Whoopee! As time permits I'm currently reading through the post-Whoopee-merge Whizzer and Chips in order to gather material for my series Whizzer and Chips - the Cheeky Raids. This doesn't involve scanning the entire comic, just any raids that involve characters who originated in the toothy funster's title (and I've found a surprising - to me, anyway - number to date, which will be posted in the weeks to come). 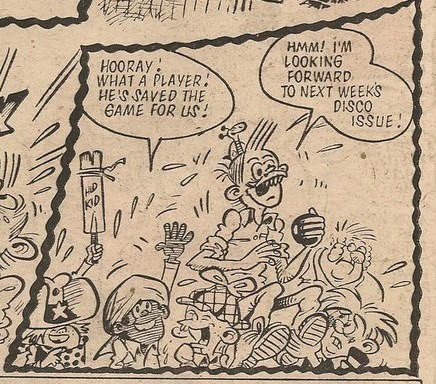 Ideally I would like to scan all my Whizzer and Chips in their entirety at some point (I don't have a full run but I have from 1975 to - I think - just before it folded), but at the moment I'm looking forward to completing the Whoopee scans - scanning is not the most riveting of pursuits. 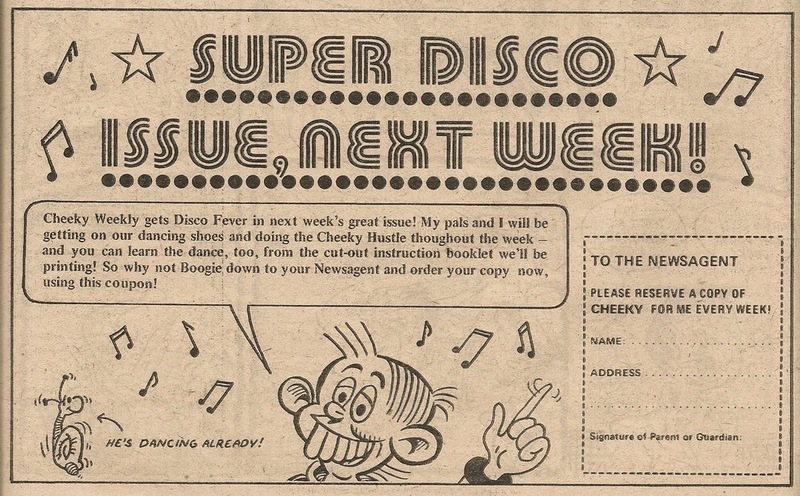 As IPC's 1979 Star Guest promotion reached its 11th week, readers of Whizzer and Chips were introduced to our pariah pal Disaster Des, who had previously made a Star Guest foray into companion title Whoopee! during the promotion's fourth week. Readers of this story who were previously unacquainted with the young doombringer could easily get the impression that Des was a malevolent character rather than the unwitting instigator of calamity familiar to regular Cheeky Weekly readers. 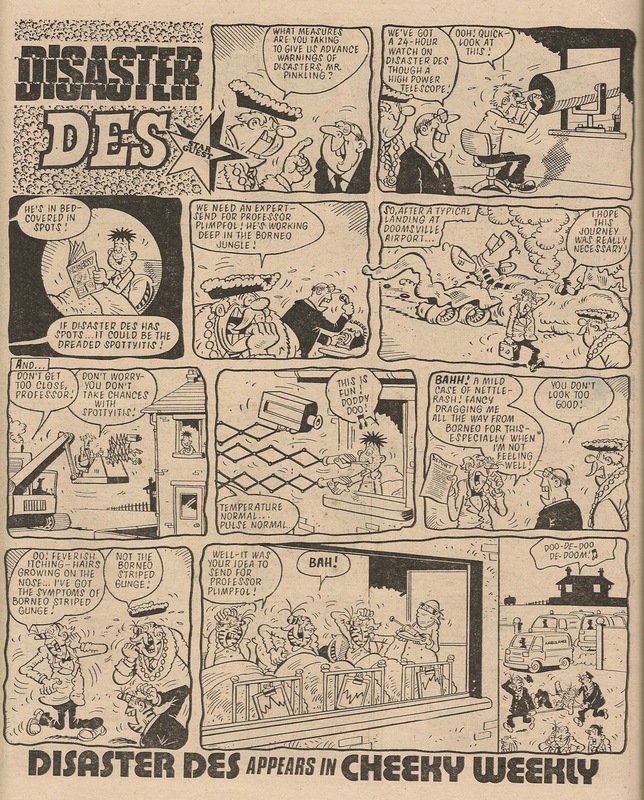 Not only that but, although it's a nice fun strip, it's a rather odd choice with which to introduce Des to an audience who may well be unfamiliar with him since the 'hero' appears in only 3 panels, and in 2 of those he's silent. The story focuses more on Doomsville's long-suffering Mayor who was a recurring character in Des' Cheeky Weekly strips. This strip was new and never appeared in Cheeky Weekly. Any Whoopee! readers persuaded to purchase the same week's edition of Cheeky Weekly in order to enjoy another helping of DD would have found the Mayor again contending with Des in the catastrophe-causing kid's home title. 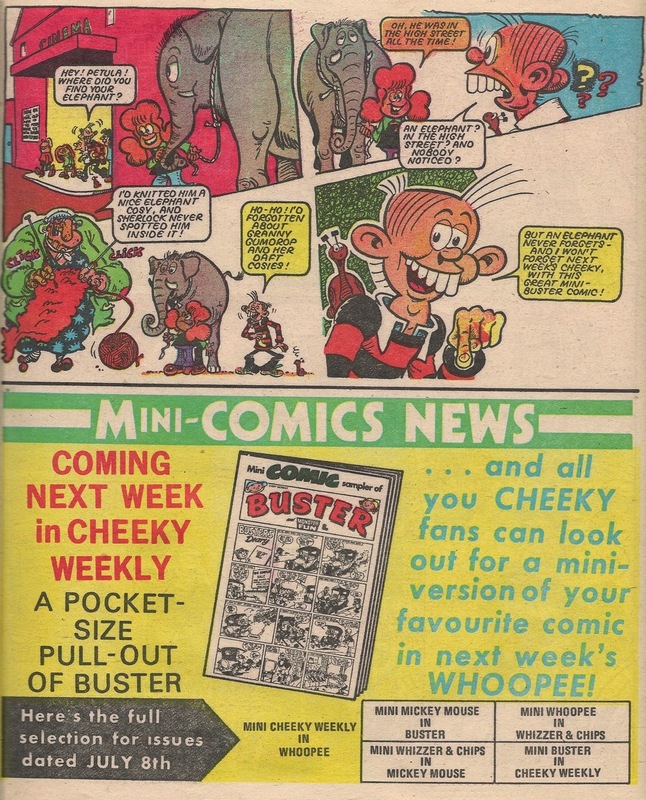 Had they chosen to place a regular order, new readers of the toothy funster's comic could have enjoyed 32 Des episodes before Cheeky Weekly suffered its own disaster and folded, consigning Des to comics history (barring a few, largely disappointing, appearances in the Cheeky Annuals and Specials). 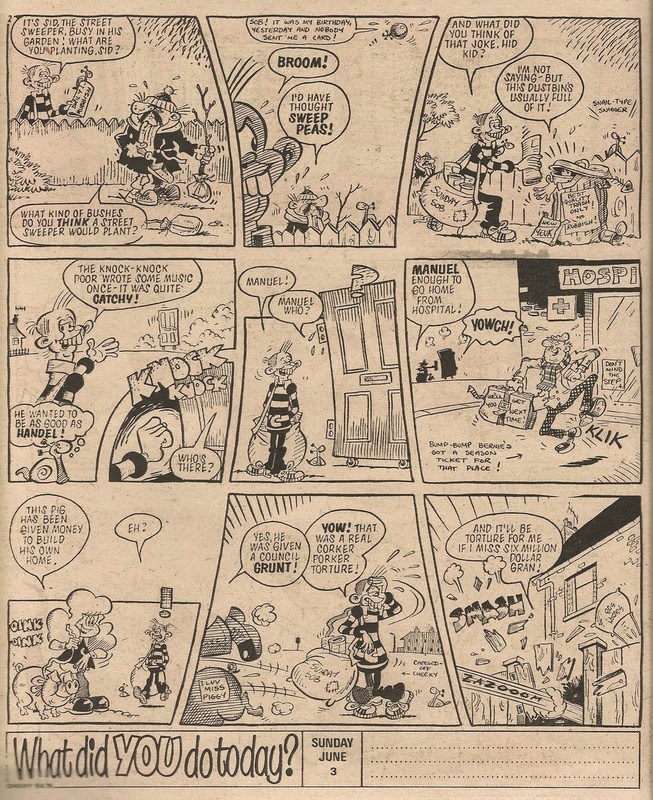 A number of the supporting cast who populated Cheeky's Week in his own comic originated in the Cheeky pages in Krazy. 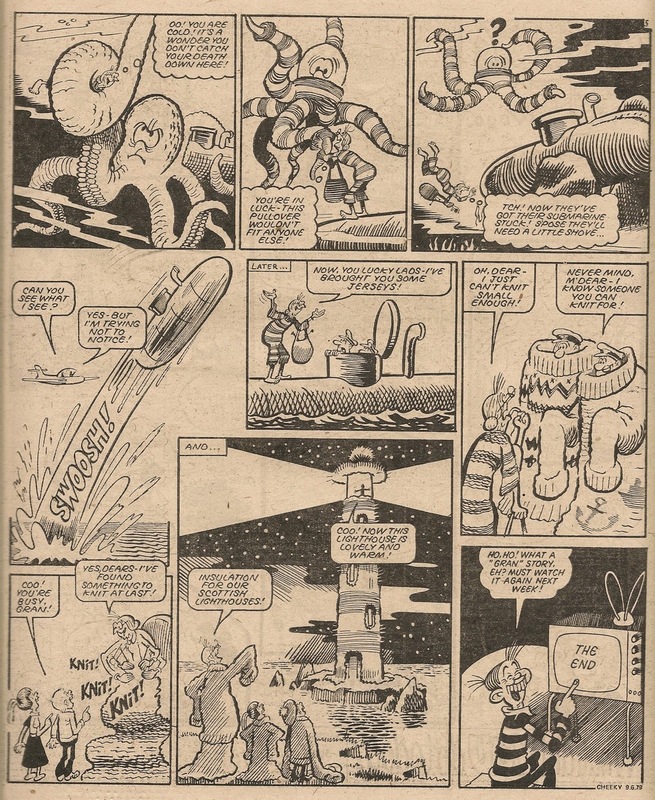 However not all the characters who appeared more than once in the toothy funster's Krazy strip made the transition into Cheeky Weekly. 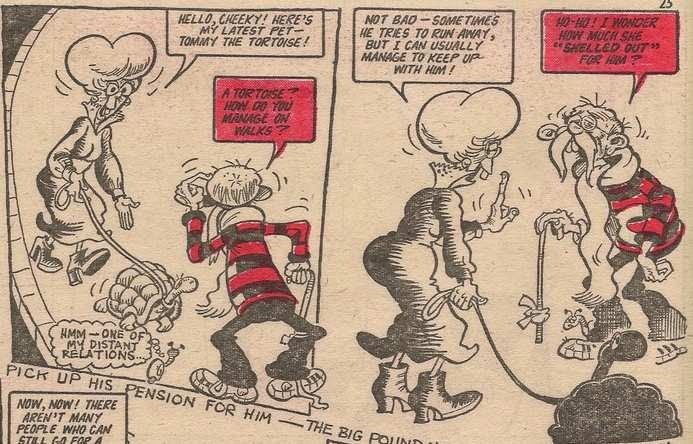 The 'Ello It's Cheeky strip in Krazy's debut issue included a panel in which the toothy funster was accosted by an un-named girl who set up a gag about her brother. 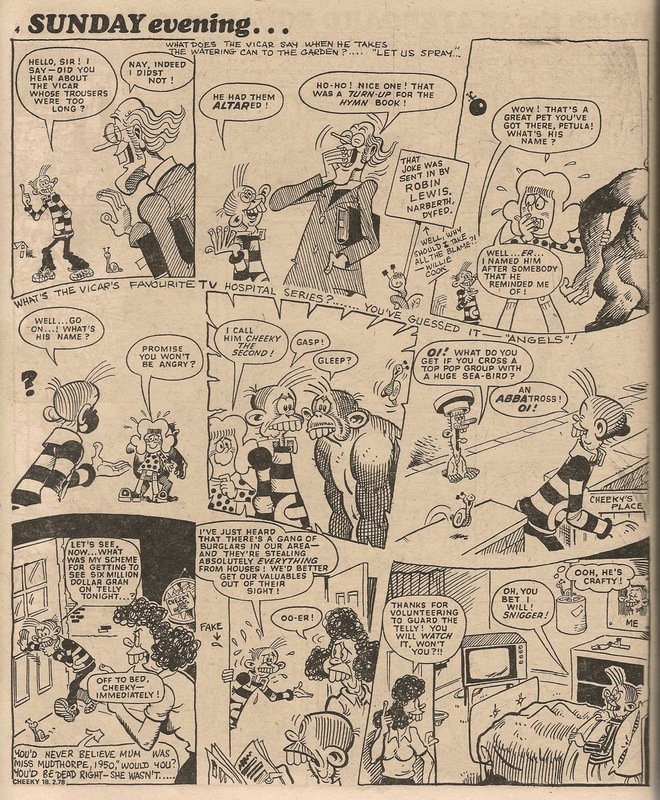 first issue of Krazy dated 16 October 1976. The same girl (who remained anonymous throughout her Krazy career - Brother Girl is my rather uninspired name for her since, with 2 exceptions, all her feed lines referred to her male sibling) went on to make a total of 9 appearances with the toothy funster in Krazy, although she had no dialogue when appearing among the Krazy Town supporters at the footie match in the 27 November 1976 issue. She appeared twice in the comic dated 04 December 1976, the first time setting up another brother gag, and the second as a non-speaking audience member at the theatre. 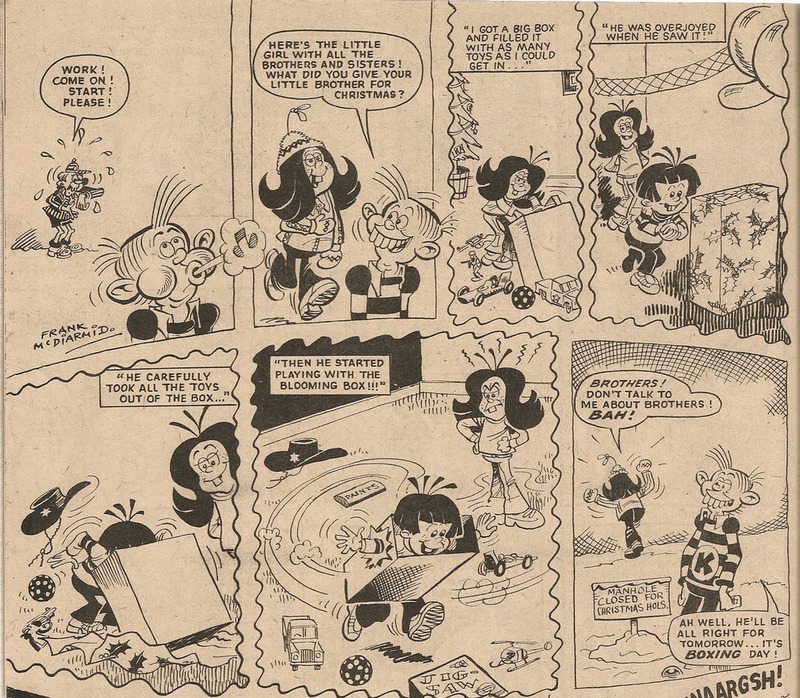 Brother Girl's extended moment in the Krazy spotlight occurred in the 25 December 1976 edition where, unlike all her other appearances as Cheeky's stooge, she got to feature in several panels. 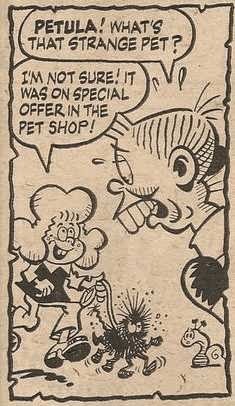 Thus BG bowed out of Cheeky's life 8 months before the toothy funster's own comic made its debut. Maybe the scriptwriter got bored with the character. 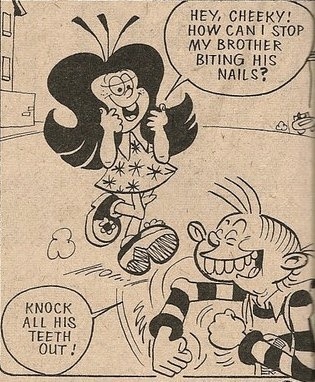 Maybe Louise saw BG as a rival for the toothy funster's affections and warned her off. Peter has posted the final Cheeky's Movie Masterpiece strip from Whoopee! The large single-panel gag component of this week's Cheeky's Week...Sunday cover strip is instigated by the toothy funster's subterranean stooge Manhole Man, who is becoming something of a fixture on the front page as he also featured prominently on the 26 May and 02 June issues. This is a pure-Frank McDiarmid page, in which we observe that the Sunday Sumfink is Manhole Man's choice of reading on the day of rest. 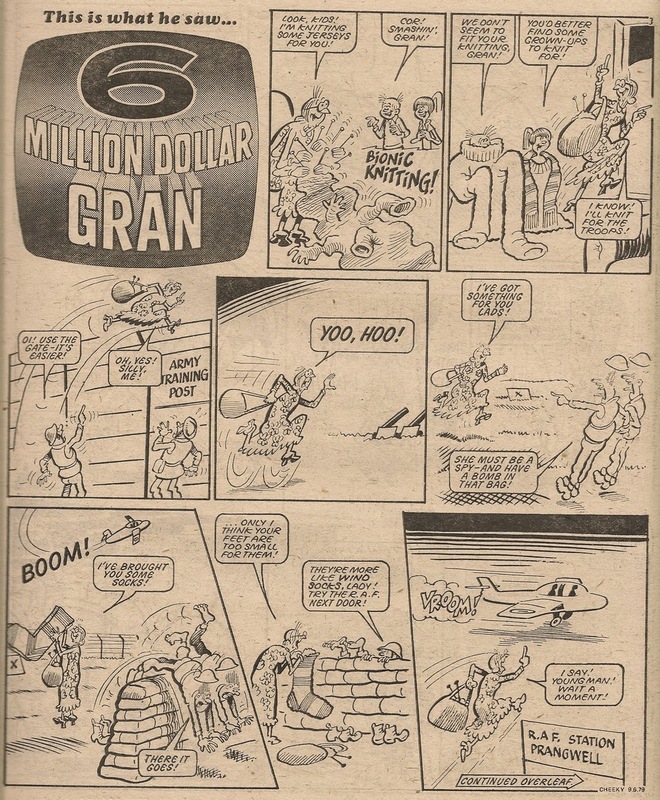 Progressing to page 2 it becomes evident that the artwork in that location has been produced by Frank McDiarmid pencils. A swift reference to the Cheeky Weekly Artist Index reveals this is the first FMP page since the 26 May 1979 comic. Aged automaton 6 Million Dollar Gran appears to be impinging upon Granny Gumdrop's area of expertise in this episode – I like the parachute gag. The latest Star Guest emissary to Cheeky Weekly is Lazy Bones who somewhat surprisingly has summoned the energy necessary to make the journey from Whizzer and Chips. Luscious Lily Pop is the source of the Mystery Comic this week, wherein our moneyed mate Mustapha Million follows Gran's example by incorporating a parachute into his adventure. 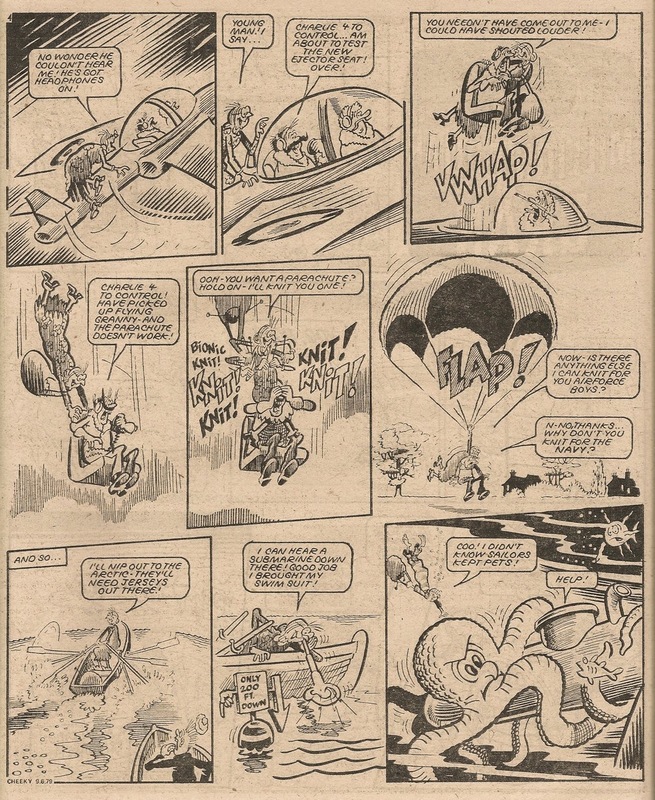 There's a full complement of Mystery Comic strips in this week's issue, the first time none of the characters have been absent since 10 March 1979. Returning to the Cheeky Weekly section of the comic, pages 21 and 22 contain the concluding instalment of the incredibly dull Spotter Book of Town and Around, so good riddance to that. 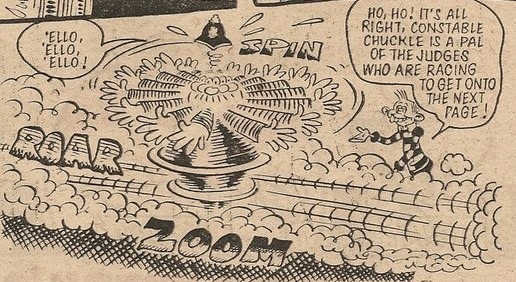 The final panel of Thursday looks as though it was originally intended to introduce Speed Squad (who are absent this week), however as Cheeky explains, the following page is in fact the site of Joke-Box Jury (featuring, as it often did, some jokes which would be judged inappropriate today). Cheeky's Saturday is devoted to a cricket match, and our grinning pal leads his team to victory over Teacher's opposing side. The final panel features a rather odd-looking toothy funster in the midst of the celebrations. Mirthful mesmerist Hypno-Tessa is the subject of this week's Burpo Special on the back cover. 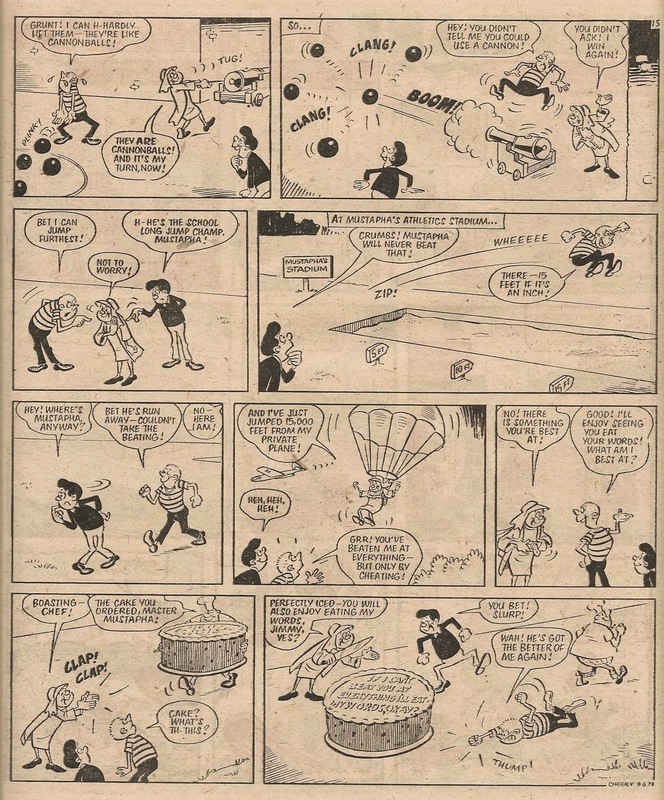 After last week's all-pure-Frank McDiarmid Cheeky's Week, we're rationed to a single page of pure Frank this issue, as Frank McDiarmid pencils contribute 8 Cheeky's Week elements and Mike Lacey delivers the Burpo Special.